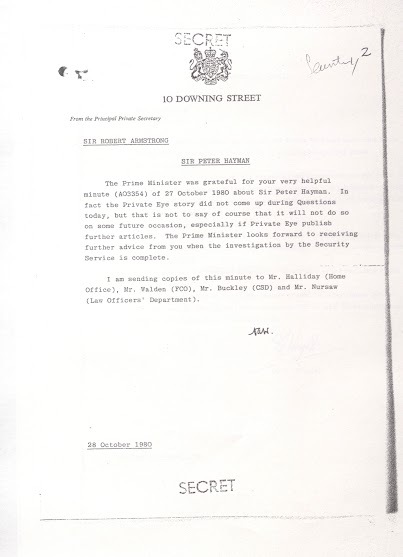 Just to say, although it now says everywhere that Hayman was “Deputy Director of MI6”, anyone who knows how the Diplomatic Service works knows this can’t have been true. 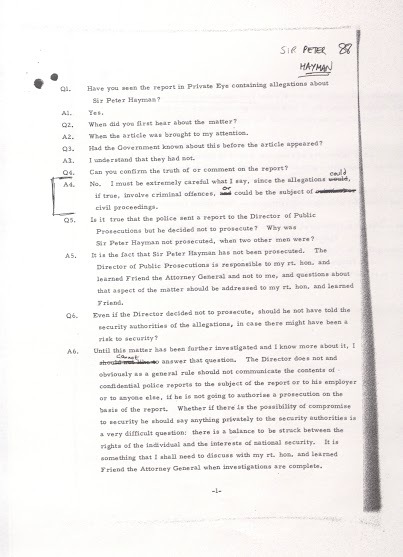 Indeed the names of the SIS deputy directors for the relevant period are known and available through open sources, so it is a little surprising that this has circulated without correction for so many months. 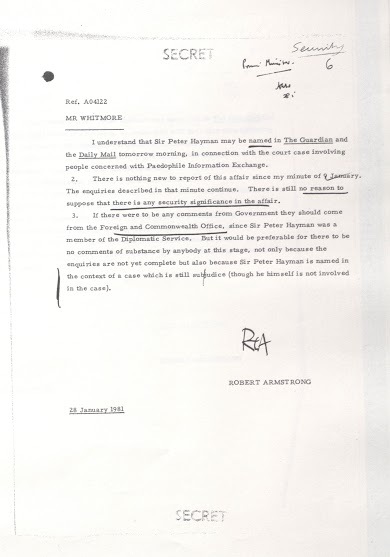 As far as I can tell, the claim was first published in a short item in the Guardian, which was however not written by one of the Guardian staff who knows about such things. 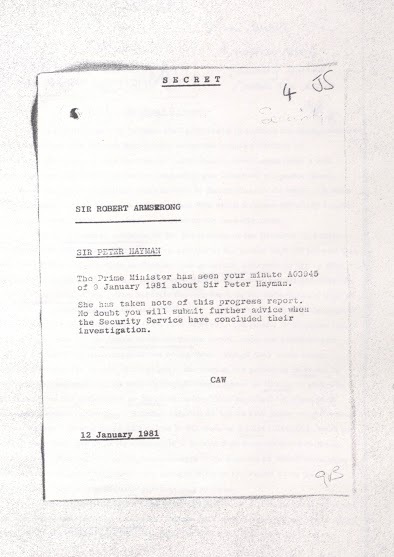 So I suspect it may just have been a misunderstanding (I can’t comment on what work Hayman may or may not have done for, for example, MI5 or the MOD as I just don’t know) and this has since simply been copied by everyone else. 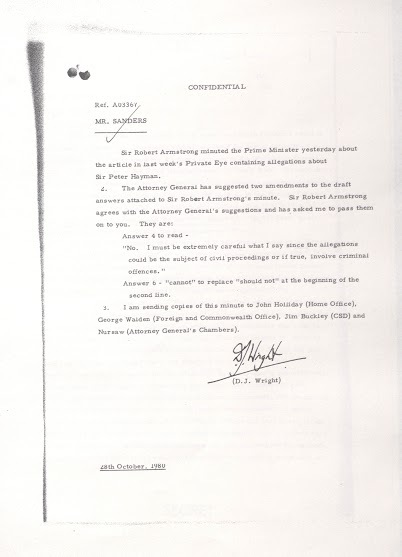 The Exaro website gave the claim wide publicity in the autumn so I wrote to them with more information but they did not reply (their articles are still available, uncorrected, or at least were when I last checked). 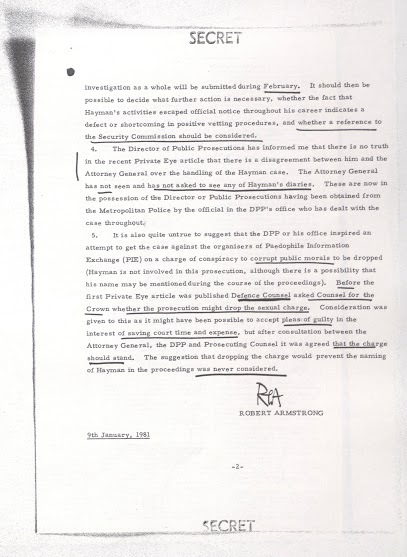 When I posted a short clarification on their website it was removed, which has led me to doubt the journalistic seriousness of the Exaro operation. 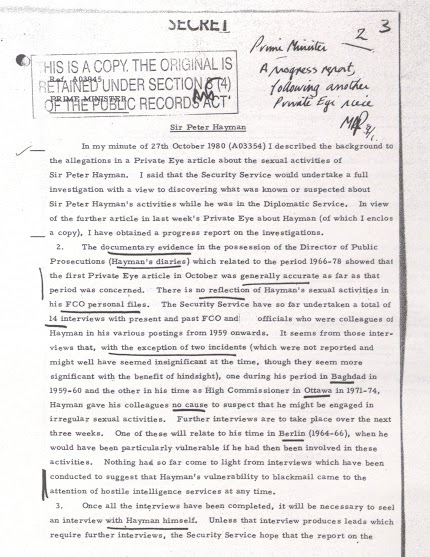 That Hayman was both a senior diplomat and interested in paedophlia is undisputed. 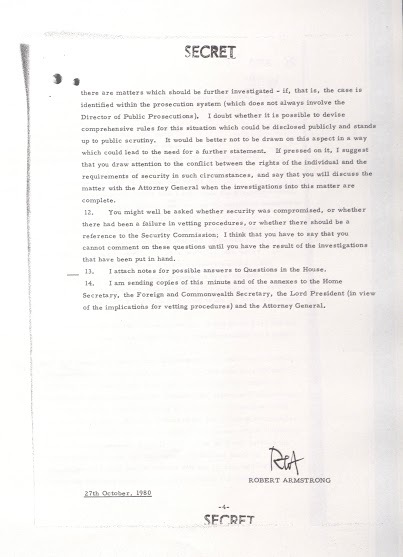 But the MI6 deputy claim is wrong. 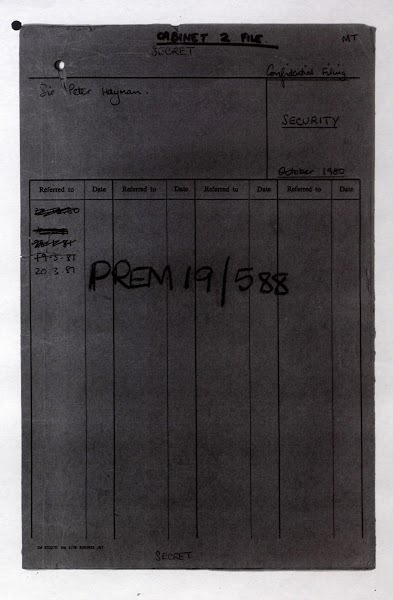 Many thanks for this. 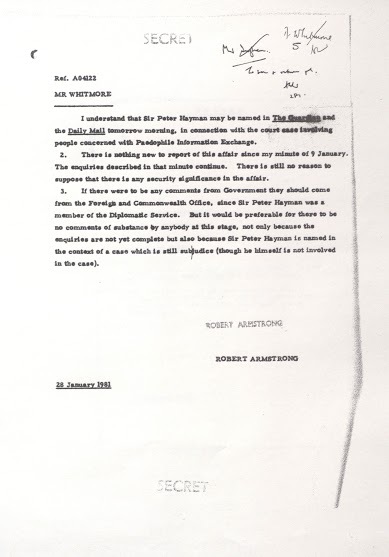 I had been wondering again about the basis for the claim that Hayman was MI6 Deputy Director, but this seems to clear the matter up. 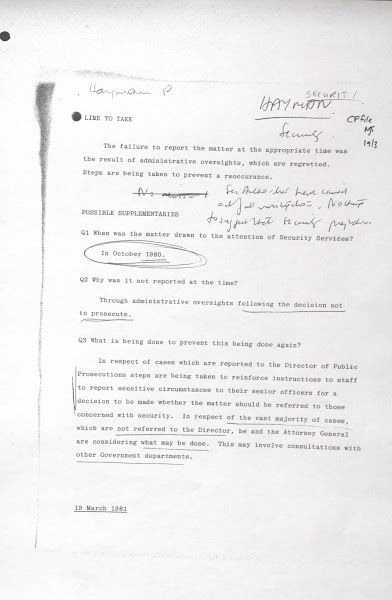 Will draw attention to your comment. 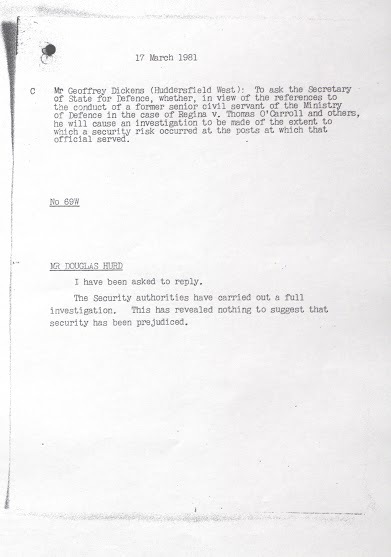 It’s worth noting that the no.2 position in MI6 in the 1970s, held by Oldfield was Deputy Chief of the Secret Service. 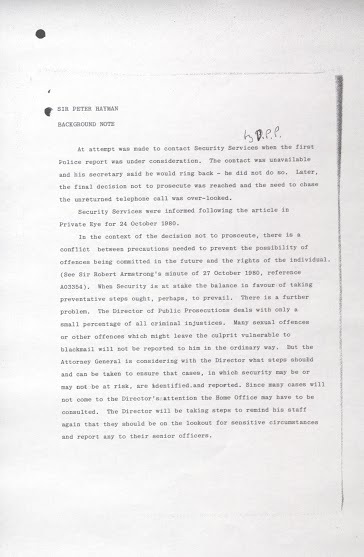 There would have been several Deputy Directors within given directorates, much as with Peter Wright’s famous position as ‘former assistant director of MI5’ which appeared on the dust-jacket of Spycatcher. 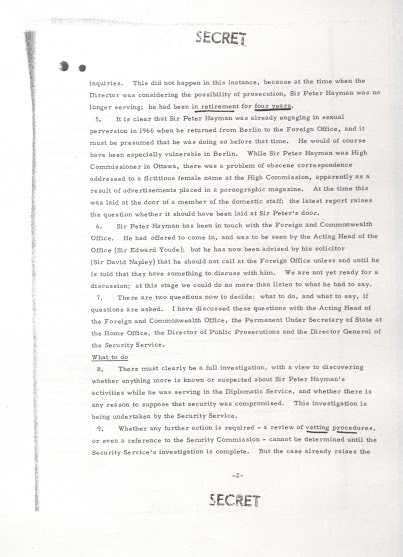 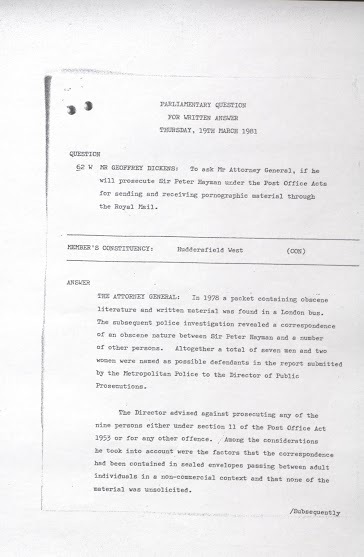 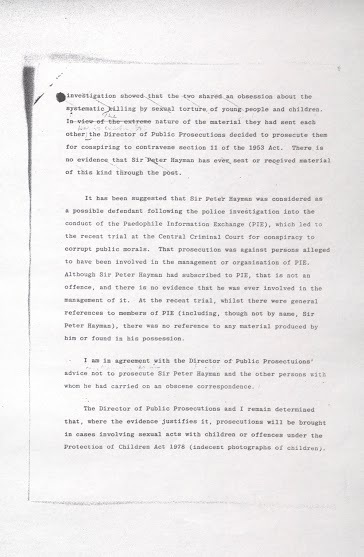 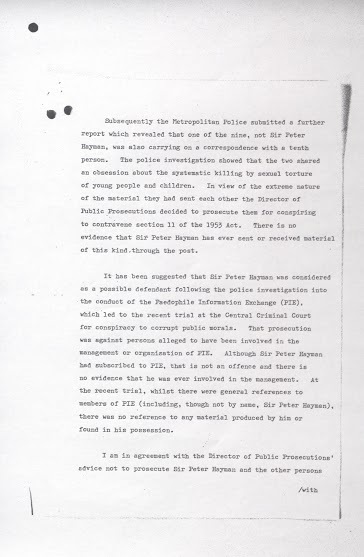 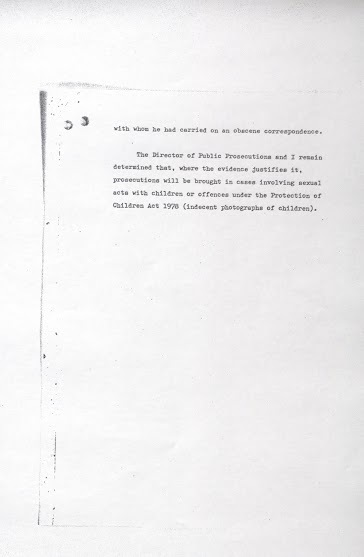 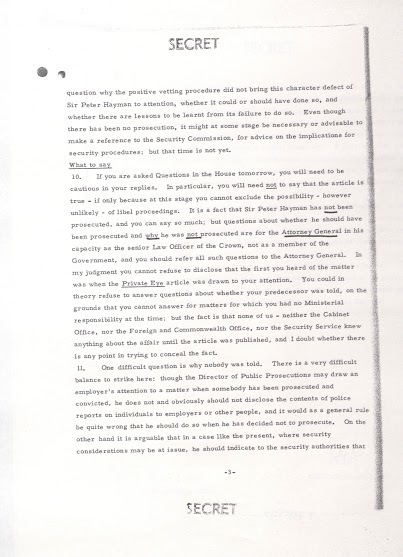 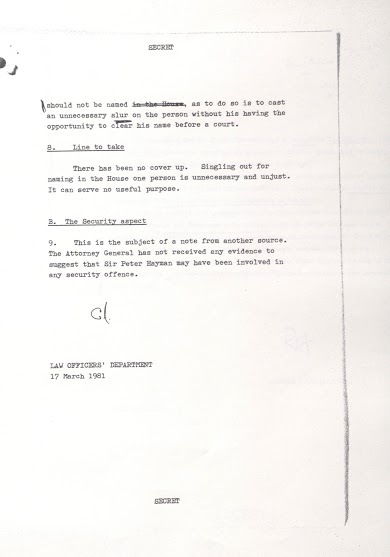 The statement in the Hayman file that he didn’t have an intelligence background obviously counts against any of these possibilities but it’s also worth noting what appears to be a redacted word in Armstrong’s note of 9/01/81 re interviews with ‘FCO and [..] officials’ who were colleagues of Hayman from 1959. 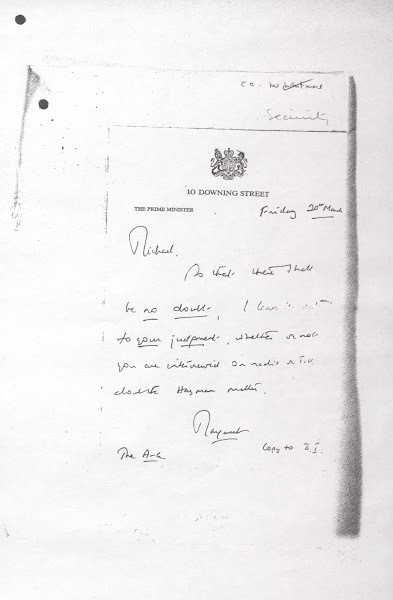 Could the missing word be MI6 or, more, likely SIS? 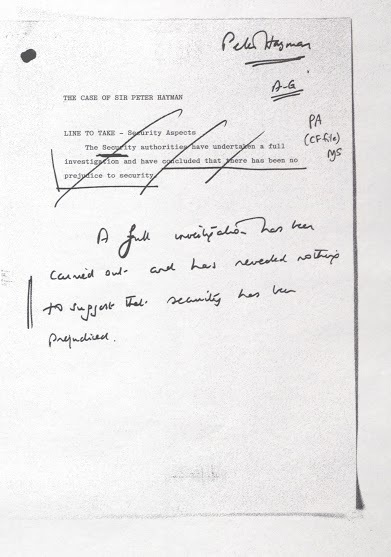 All of that said, it may well be that the MI6 claim is straighforwardly wrong. 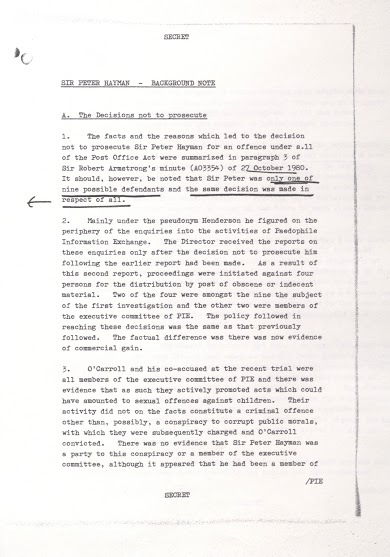 But if Hayman was a regular MI6 officer under diplomatic cover could Armstrong really gave told Thatcher that he didn’t have an intelligence background? 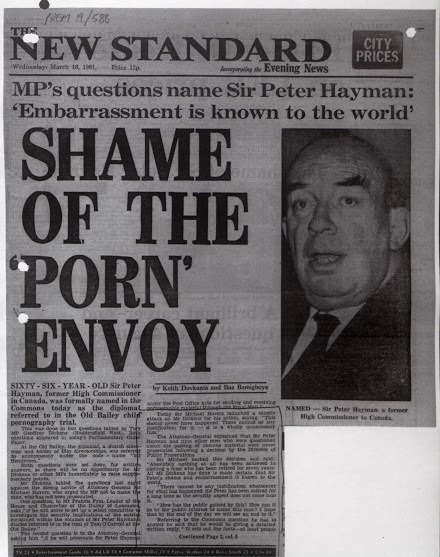 Have just done a search for ‘Peter Hayman’ & ‘MI6’ on Nexis. 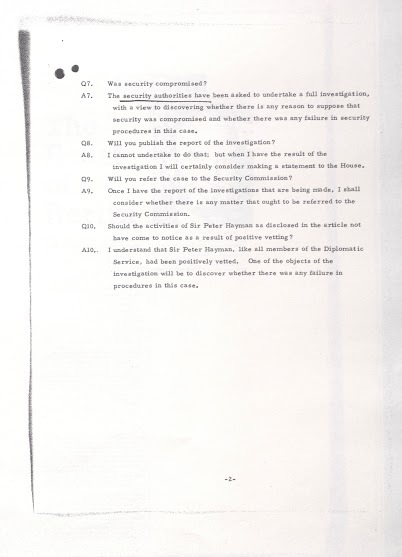 The earliest sources for the claim I can find are from 2013. 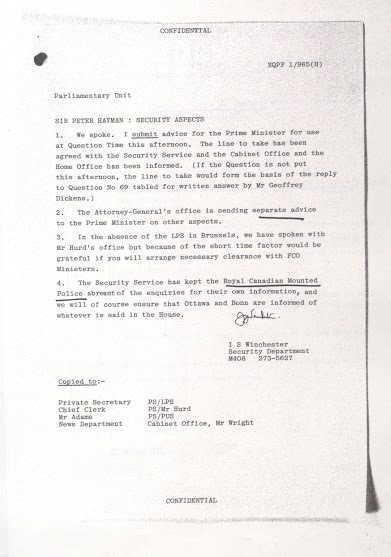 Keir Mudie ;Nick Dorman, WAS IT COVER-UP? 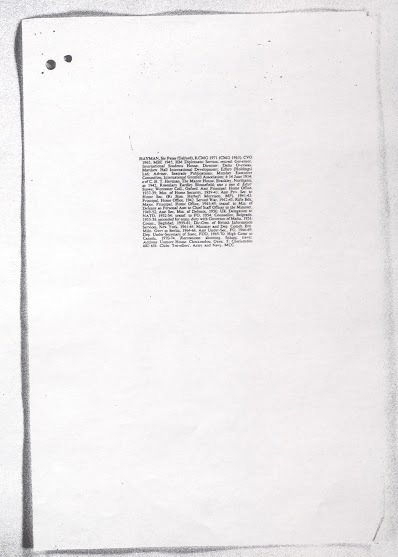 ; The People, February 10, 2013. 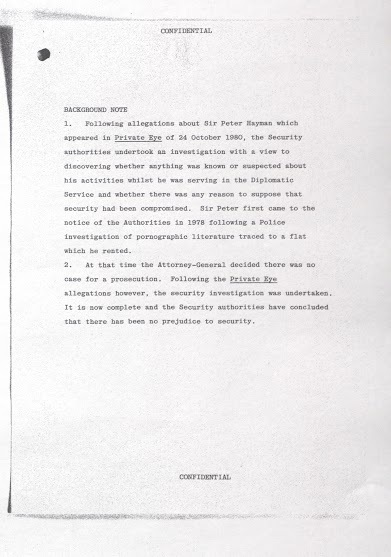 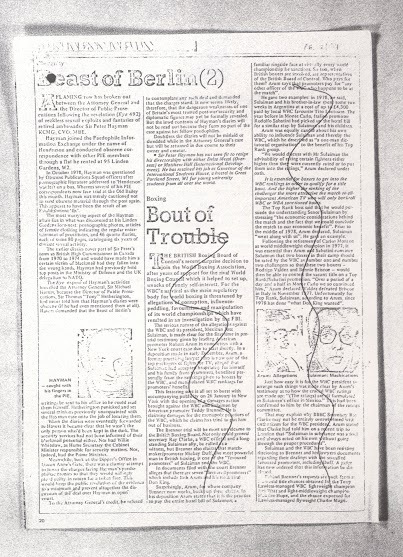 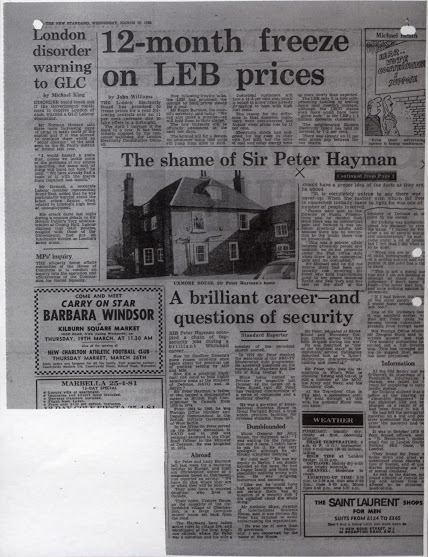 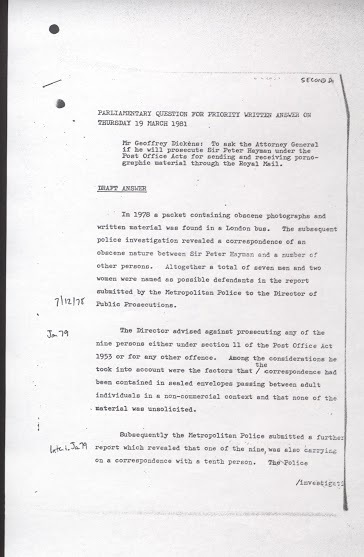 ..A police investigation found vile correspondence between Sir Peter and several other people. 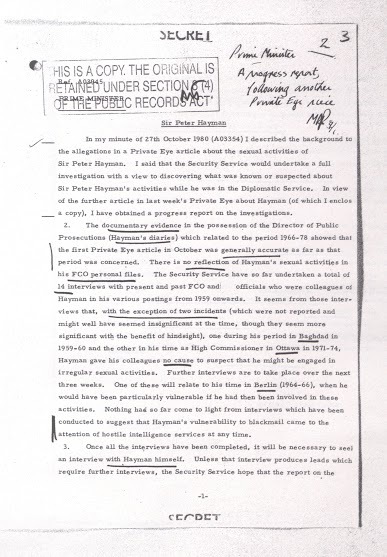 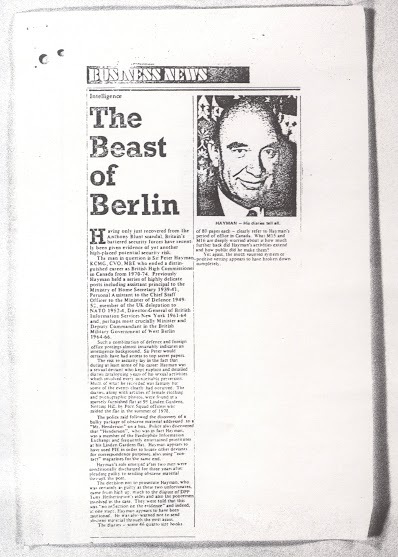 That said, for a diplomat like Hayman the inference from the original Private Eye’s story’s suggestion of an intelligence background probably always implied MI6. 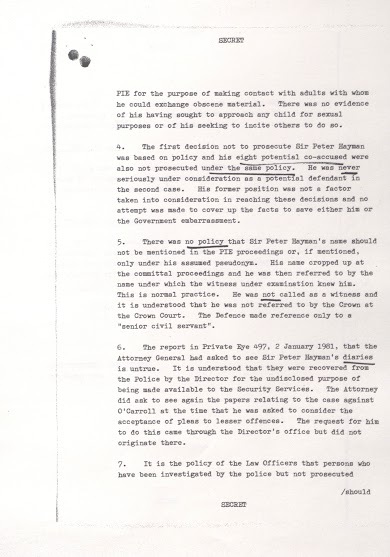 Just a couple more thoughts on the above. 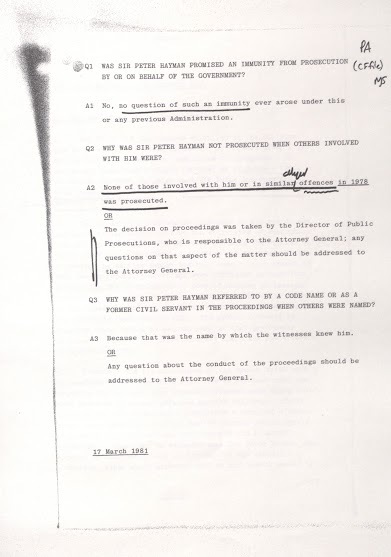 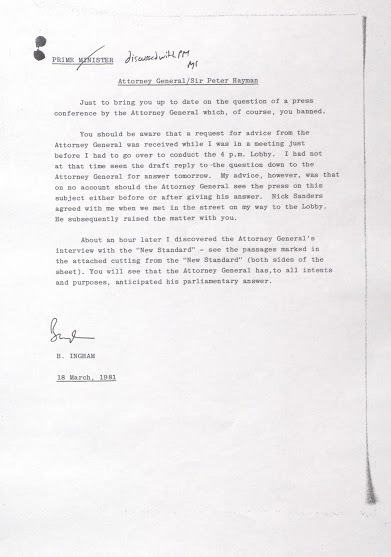 Does Mrs. Thatcher’s banning (on the advice of Bernard Ingham) of the Attorney-General ‘s holding a press conference count as a cover-up? 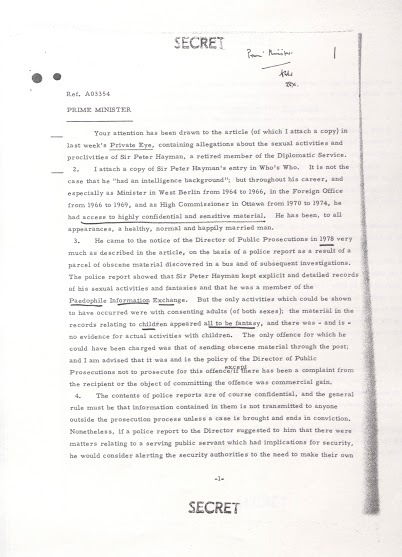 Also, it would be interesting to know what exactly the “incident” in Baghdad in 1959-60 involved.